Over the last decade, outpatient surgery has consistentlygained in popularity by providing a significantreduction in the cost of hospitalizationand the patient’s length of stay. Foot and anklesurgery procedures are commonly performed inan outpatient setting [ 1]. Key issues in foot andankle surgery include rising demand for outpatientprocedures, managing postoperative painand decreasing the use of opiates, and avoidingthe side effects of general anesthesia in certainpatient populations .Foot and ankle surgeries ,producemoderateto-severe postoperative paih that issometimesdifficult to control with oral pain medicationsalone . Research has shown that regional anesthesiahas been used successfully in foot andankle surgeries to reduce postoperative pain ,with one study reporting that regional anesthesiareduces perioperative opioid requirements [ 4].Another study indicated that monitored intravenoussedation can be safely and effectively carriedout together with regional anesthesia in footsurgeries. The article reported high patient satis-faction and reduction in postoperative pain usingthis combination . Using monitored intravenoussedation instead of general anesthesia significantlyreduces side effects, including nausea,vomiting, and throat discomfort. Intravenoussedation also reduces recovery time and avoidsunwanted admission to.the hospital . The combinationof regional anesthesia with monitoredintravenous sedation can also be used in AmericanSociety of Anesthesiologists (ASA) 3 and 4patients undergoing lower limb-preservation procedureswithout increasing their pulmonary orcardiac complications. This finding is significantbecause historically it has been assumed thatASA 3 and 4 patients needed to be under generalanesthesia regardless of the surgical proceduredue to the higher rate of complications associatedwith this patient population . There are alsoother specific patient populations in whichregional anesthesia may be a superior anesthetictechnique. Patients with asthma, for example,benefit greatly from regional anesthesia becauseit avoids airway manipulation [ 1].Despite the numerous benefits of regional anesthesiareported in recent studies, there is someanecdotal evidence that performing regional anesthesiaincreases operating room time and delaysturnovers . However, with judicious preoperativetiming and planning as well as skillful regionalanesthesia administration, delayed turnover can beminimized. This chapter discusses several commonregional anesthesia techniques in foot surgeriesand offers clinical pearls. © Springer International Publishing AG, part of Springer Nature 2018A. D. Kaye et al. (eds. 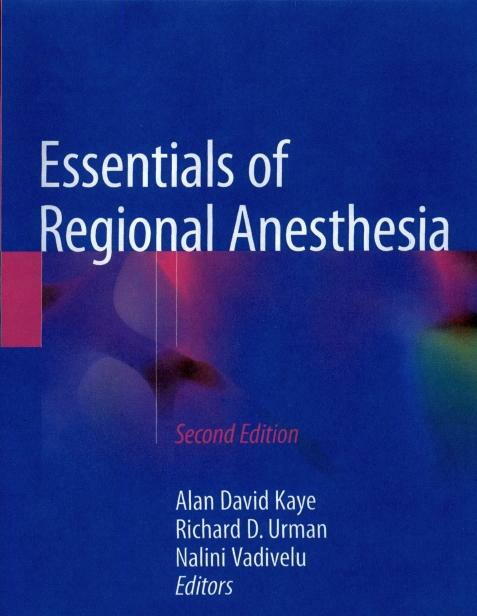 ), Essentials of Regional Anesthesia.